This review is written by my student Chandler. A boy named Garth had an incurable disease. 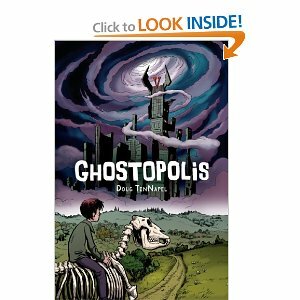 He got transported to Ghostopolis (a ghost world) by Frank (a ghost transporter). The company that Frank works for tried to send out a rescue team, but it was going to be three months before they could deploy. Clair, who was a ghost was a friend of Franks, and had a car that could go to Ghostopolis! So Frank and Claire headed out. Meanwhile Garth met his grandfather who was younger than him! (He grows through the book). Garth goes through many obstacles and then Vaugner, ruler of Ghostopolis fought Garth in an epic battle! I think Ghostopolis was a great book. Who writes about a ghost world? Nobody. I can connect to Garth because he got into a messed up situation and I’ve done that. I would recommend this book to people who like adventures, ghosts and stories with happy endings.